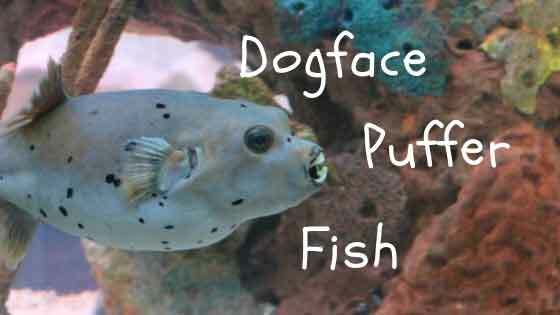 The most polarizing saltwater fish in the aquarium hobby has to be the dogface pufferfish. You either think they’re awesome to look at or awful. There is no in between. The one thing we can all agree with is that it certainly has an unfortunate name, which may be why they also go by the name of blackspotted pufferfish. Their eyes and snout clearly remind me of a dog’s, which is amazing to see in the reef tank. And they certainly have a lot of personality. I just can’t make up my mind whether I think they look really cool, or really weird (and therefore cool by proxy). What it lacks in raw (traditional) beauty, the blackspotted pufferfish makes up for with cool and interesting factoids. In addition to the short snout and pouty eyes, this rough-skinned fish also has a set of teeth that would make your orthodontist jealous. These teeth are shell-crushing vices because their natural food is shellfish. The dogface pufferfish is a saltwater species predominantly found in the Pacific and Indian oceans. Dogface pufferfish are best cared for by “intermediate” aquarists with at least some experience in catering for unique species–mostly because of their picky feeding habits. You’re not likely going to get this hungry meat-eater to learn to take flakes. And even if you did, you’d have a major dentistry bill on your hands, since their teeth are made for cracking shells and will grow too large if they don’t encounter enough hard stuff to wear them down. These fish don’t require anything special, in terms of water quality. The standard reef aquarium water parameters are sufficient. Temperature, pH, Nitrates, and Salinity are the most important parameters for these fishes. Pufferfish are usually nocturnal hunters out in the ocean. When introduced to captivity, they might initially appear shy, refusing the food you provide. As it acclimates into this new state, they become bolder, sometimes pleading for food in that charming, puppy-like manner. They feed mostly on invertebrates with such species as mollusks, algae, crustaceans, sponges, corals, and sea squirts an important part of its diet. Their strong, hard teeth will have little problems tearing into the shells of these species, even benefitting from constantly chewing on corals which wear down its constantly growing teeth. In your home aquarium, their diet should consist of meaty foods, such as raw shrimp, squid, krill, mussels, and clams. Invertebrate foods with hard shells and are needed to help keep their teeth from overgrowing. The dogface pufferfish can grow to be over a foot in length (that’s around 30+ centimeters for those of you using the metric system–but then again, those of you using the metric system know how to convert that…it’s the rest of us that don’t know how…). The black spot pufferfish is considered to be non-aggressive or semi-aggressive, as long as you’re not a tasty invertebrate–because they have giant teeth for breaking into and eating clams, crabs, and shrimps. They should otherwise leave your fishes and corals alone. Due to their large size and meat-eating disposition, they are often kept in tanks with larger aggressive or predator fishes. Ideal tankmates would be other non-aggressive (or moderately aggressive) puffer species, triggers, lionfishes, snowflake eels, possibly large select tang species, and large wrasses or angelfish will make for good companions. Fish with long fins might find the pufferfish nipping on their fins. 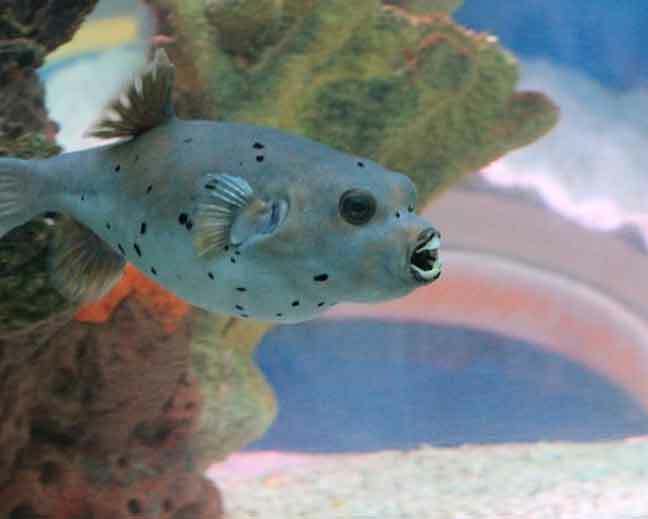 Feeding your dogface puffer with hard-shelled invertebrates will help check the growth of its teeth. If you’re not careful, the teeth could grow so large that they prevent the fish from even being able to eat anything. That is why I recommend only intermediate or advanced aquarists try their hand at caring for man’s best (aquatic) friend. Also, if your motivation for keeping these amazing creatures…is that you love the idea of watching a puffer inflate itself…you should probably think again. Okay, I’m on your side, it sounds like it would be awesome to see and show off. But it’s not good for the fish. They obviously only inflate themselves when they are stressed, and things can go wrong when they do. If they may get too much air during this process, they could have trouble shrinking back to normal size and die. Which would be a big bummer for both of you, but mostly for your fish. Please also note that the dogface pufferfish sometimes proves difficult to feed, especially when stressed, insecure or shy. This is especially the case when they are first introduced into the tank. Make sure they feed properly before purchase. Slow feeding is sometimes the result of internal parasites, which a proper dose of fenbendazole will help eradicate. The dogface pufferfish is certainly an interesting saltwater fish worthy of consideration as you plan out the livestock additions for your own tank. They are big, (sometimes) beautiful and are certainly eyecatching in the tank, as they swim around seeming to crave your attention. They require some specialized care in terms of what and how often you feed them, to be they don’t develop dental problems as they grow older. The blackspotted puffer is a shell-cracking, invertebrate eating machine, which means it isn’t totally reef safe. But if you have a large tank where you want to keep aggressive or semi-aggressive fish, they could be a cool choice. Please leave a comment below and let us know what you think? Awfully beautiful? Beautifully awful? Quirky, cool and personable? What’s your reaction?